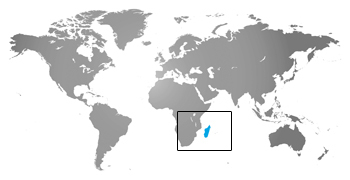 Off the coast of eastern Africa, the ring-tailed lemur lives on the large island of Madagascar. They live mainly in forested areas. Lemurs munch on fruit, leaves, bark, flowers, grass, and tree sap. Lemurs eat by holding food with their front feet. Ring-tailed lemurs are active both during the day and at night. Although they live mainly on the ground, they are very comfortable moving around in treetops. Lemurs escape to these treetops when threatened. They will defend their territory and signal alarm with loud calls. Lemurs are always on the lookout for birds of prey, a natural survival instinct. Art the zoo, the whole troop will look skyward when a hawk or even an airplane passes overhead. Ring-tailed lemurs live in social groups of five to twenty individuals. The group huddles together into a “lemur ball” to stay warm in cold weather. Males move from group to group, but females, who are dominant over males, and their young stay together. Ring-tailed lemurs are born with lots of hair and with eyes wide open. At first, the baby clings to its mother’s chest, but later it will ride on her back. The young are independent after six months. Less than 10% of Madagascar’s original forest cover remains, putting all 30 species of lemurs in jeopardy. The Fort Wayne Children’s Zoo participates in the Association of Zoos & Aquariums Species Survival Plan (SSP) for the Ring-Tailed Lemur to ensure the survival of endangered wildlife species.